Are you looking for a mountain bike that ticks all of the boxes? The Trek Session is just such a bike thanks to its speed, precision, and durability. The bike has a carbon frame and weighs a little over 15 kilos. All of its top tier components mean that the Session is expensive. The thing about the Trek Session is that it comes from good stock. The predecessors of this model have been responsible for numerous downhill championships. In fact, it is arguably one of the best downhill bikes around. Right from the start, you know that this bike is a winner. Of course, this just means that the Session has a lot to prove. This is why we did not waste another moment before hitting the trails with it. To our absolute delight, the Session did not disappoint in the least. This bike is quite fast, regardless of the terrain that you are riding on. It is also incredibly responsive, moving fluidly where you point it to. That being said, we did find that although the Session is quite capable, it was easier to maneuver in the smoother spots. Still, the suspension is quite remarkable and you will not be getting much trouble regardless of what you hit. If you want luxury while on rougher terrain, then the Session is definitely for you. Then, of course, heading downhill is simply fluid and fast. This bike is pure poetry in motion when on heading down a slope. Personally, we really did feel like this bike was a dream in every sense of the word. It is the kind of bike that you save up for just so that you can enjoy what it has to offer. This does not mean, however, that the Session is perfect. While most riders fit quite comfortably, larger cyclists may have a bit of a tough time. Even with the larger size options, it is going to be bit of a tight fit. 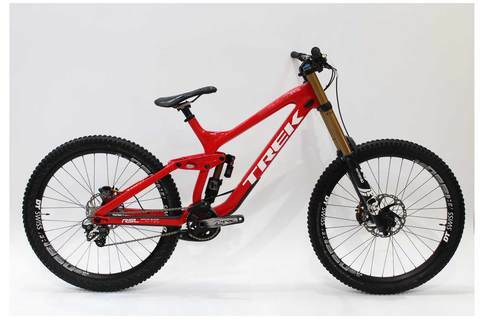 The Trek Session has done it again – it has proved just why it has topped the lists of best downhill bikes for so long. This is a fun and competitive bike to ride. If you want the best on the market, then getting a Trek Session will help you get a lot closer to that goal.